After cutting down a tree or after a storm, many homeowners are left with large [or small] stumps that can be a major obstruction in your yard. Often times, people either don’t know the risk of having a stump in their yard, think their problem will go away, or just continue to push their issue to the side. Either way, it’s important to realize the danger of having a stump protruding out of your yard, and what your options are for removing it quickly and in the most cost-effective way possible. Possibly the most important reason to remove a stump immediately is for the safety of you and your family. Although you may be aware of exactly where the stump is, small children may not realize the hazard and trip over it or fall on it while playing in the yard. Additionally, if you’re aware of the stump but get distracted, you may lose track of where it is. You can try workarounds like laying a tarp over it to make it more obvious, but this will only slightly mitigate the issue. Avoid the issue altogether and call an arborist to have it removed. Let’s admit it, stumps don’t look great hanging out in our yards. 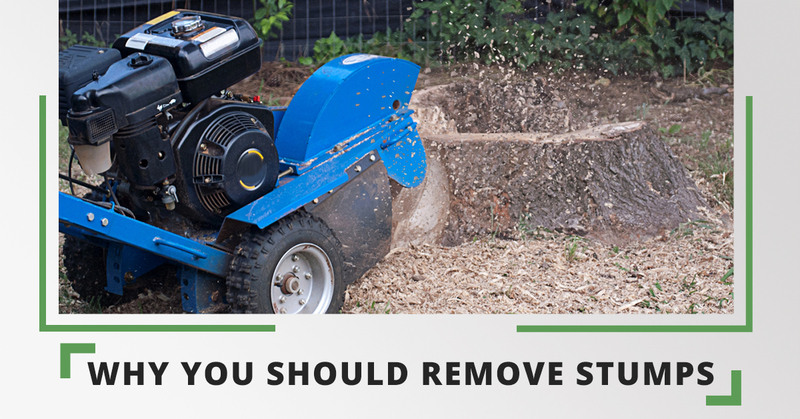 Over time, stumps will begin to rot and look even worse and have your guests wondering why you haven’t taken the steps necessary to get it removed. Also, it makes an area of your yard inaccessible and unusable; not ideal for people who enjoy spending time in their yards. Unattended stumps are a great way to attract harmful insects to your property that would otherwise not be there. Even if you are willing to put up with an obtrusive stump in your yard, you should remove it so wood-boring pests like termites can’t house themselves in the stump and in the ground. Hiring a certified arborist will ensure that the stump is dealt with efficiently in order to prevent harmful insects from harboring themselves there and wreaking havoc on the rest of your yard. In order to get the most high-quality technical removals and general tree care services, you’ll want to call the experts at Cedar Mountain. We’re your Top Rated Local® Tree and Lawn Care experts in Arapahoe, Lander, Riverton, Green River, Thermopolis, Shoshoni, Fort Washakie, and Rock Springs. We’re here for all your tree care needs in south-central Wyoming, so give us a call today!